As another year dawns brands once more face the test of understanding which of the myriad online media sites are most appropriate for their audiences, coupled with often limited information about suitability from Publications, PR Companies and Media Agencies. After all, as brands work to engage with and drive value from increasingly defined and customised audiences they need more than the usual readership demographic information available - essentially they need to understand which publications are likely to deliver the most ROI. Having delivered insight and recommendations for the most appropriate Entertainment and Sports personalities and properties for international brands such as BMW, MINI and Tommy Hilfiger using our proprietary ‘Constellation’ solution we at EntSight decided to develop a similar solution for online media, which we call ‘Mediator’. We’re pleased to say that results from Mediator have been fantastic so far, largely because the social platforms we’re mining data from are now the places where audiences share media content most actively online, meaning we can track preference for very specific audience groups and even drill down into demographic data to provide even more defined insights. This social data is also underpinned by online panel and research data from a number of reputable suppliers to ensure our insights are given the extra level of verification we know our clients need. In order to understand preferences we’ve also built a comprehensive and growing database of online media websites, from regional news through to niche publications reflecting interests such as Automotive, Travel and Photography. In order to optimise the tool we’re updating these on a regular basis and working with clients to ensure we’re covering every category and publication which is needed. 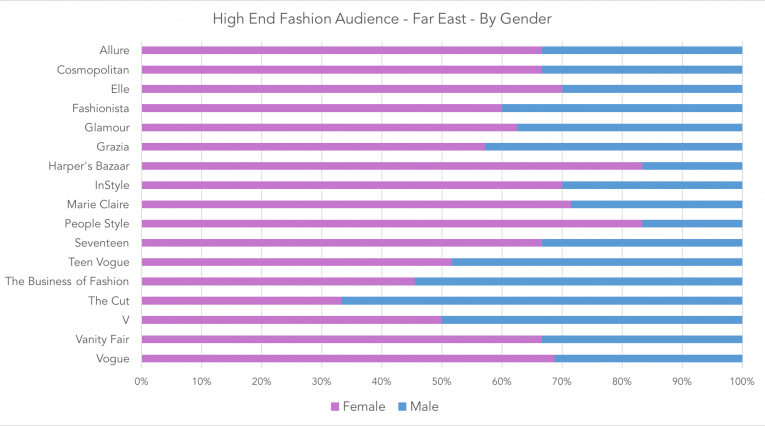 For example, in the graph above you see the most talked about, shared and linked to Fashion websites from a sample group of affluent Chinese, Japanese, Thai and Malaysian consumers who talk about High End Fashion brands such as Gucci, Prada, Chanel and Louis Vuitton. 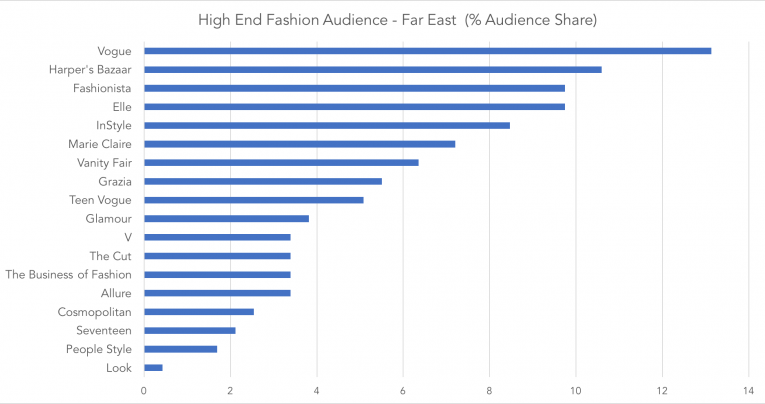 Our results confirm that luxury fashion audiences in these markets have a strong affinity with established publications such as Vogue, Harpers Bazaar and Elle - although US site Fashionista.com also scored well here too. In the results above we've taken the same audience group and broken preferences down by Gender - demonstrating the deeper demographic insights about audience preference we can learn using Mediator. 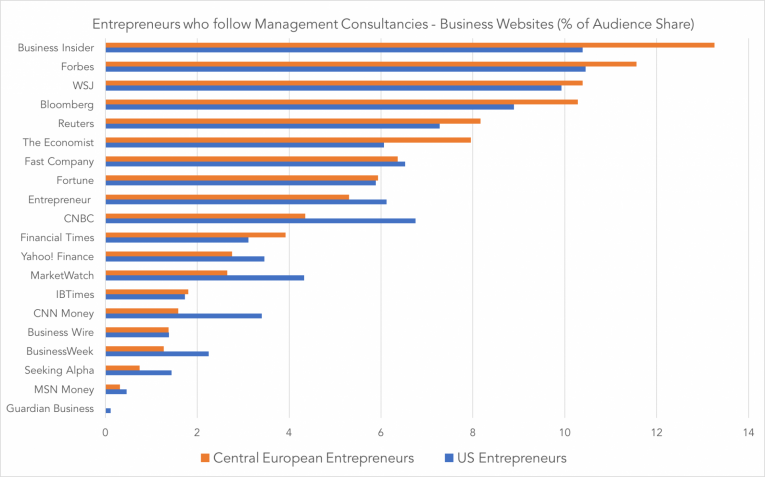 The results confirm both Business Insider and Forbes are most popular, seeing a larger share from Central European Entrepreneurs, whilst CNBC, Marketwatch, CNN Money and Business Week resonated more with U.S Entrepreneurs - useful information indeed for any brand looking to engage these audiences. We at EntSight believe it is time to move beyond using social data to just simply measure results and instead to utilise the rich insight on audience preference it can offer to inform and drive the success of brand strategies and campaigns. In 2017 we're looking forward to working with you to achieve that.